Dear international visitor, an english version of our website is in development. Please contact Klaus Kitzmüller or Jutta Rossié for more information. The idea for nikimotion emerged when Golf Tech, the market leader in the golf sector, developed a folding golf trolley that is extremely easy to operate: Why not apply this unique invention to the pram market? 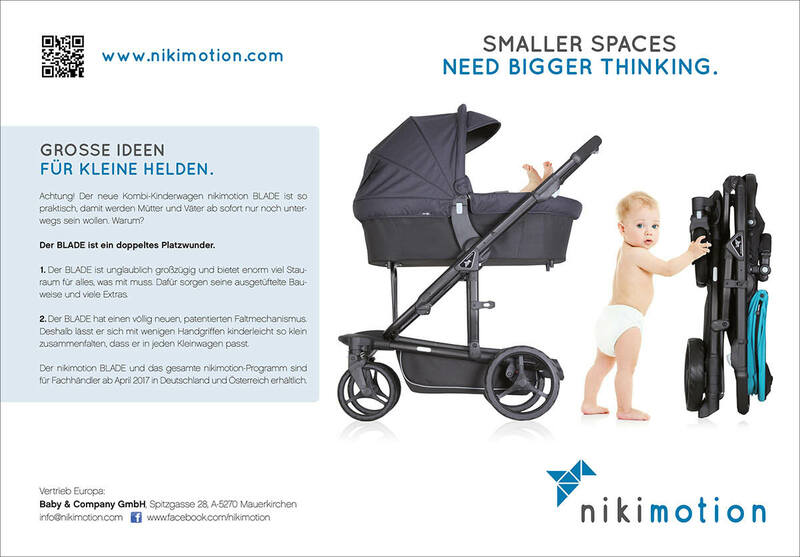 To support the market launch in Germany, move communications developed various B2B advertising motifs for nikimotion, the aim of which was to present the unique folding mechanism of the newcomer brand in an informative and emotional way. The central message is the “double space-saving miracle” of nikimotion’s “BLADE” model, which is both very spacious yet offers a lot of storage space thanks to its elaborate construction and numerous extras. At the same time, this all-in-one pram can easily be folded up so small that it fits into every small car.